Where do you find one of Mozilla’s best leadership development offerings, a place where our learning plan comes alive, and an unrivaled storytelling opportunity? With just five weeks to go to this year’s festival, we thought we should give you recap of the program journey so far. The festival is where all of our leadership offerings make sense together, and is one of the best examples of how we develop leadership as a foundation. By taking part, the community and staff leaders involved are learning open leadership. The learning isn’t just on-site — it’s also during the curation and preparation process that we develop these skills. Open practices and working in the open. Solving problems through collective action. Leveraging resources of a network to equip others to advance their lives on the web. Building confidence and overcoming imposter syndrome. Empathy and facilitating safe spaces. That means we’ve doubled the number of leaders since last year. One of the ways we have achieved this is though empowering previous participants. Heather Bailey is a fantastic example of this. She came as a participant two years ago, last year she ran a session and now she is returning to wrangle a space on localisation. The leaders who are taking part are from a diverse range of backgrounds. We have new team members stepping up which has lead to better distribution of responsibility across programs. 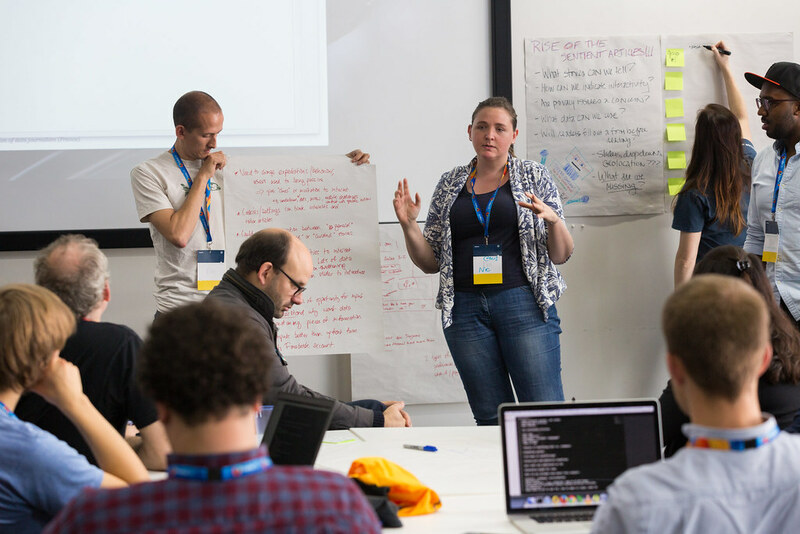 Looking back three years ago, the festival has increasingly worked across Mozilla and more teams are now deeply embedded within the programme curation. The festival has become an important moment on the Mozilla’s shared calendar. “Mozfest is the most Mozilla event Mozilla does.” — Potch. Participation team. For the first time, there will be an entire space dedicated to getting better at community participation and contributing to Mozilla projects as a whole. MDN. MozFest is a key moment in their fellow’s calendar. Content Services. Joining MozFest for the first time and curating a pathway on economics and the web. Bringing new audiences from ad-tech. Policy team. Deep collaboration through the advocacy work. But also interesting enough that staff members not assigned to these teams are volunteering to wrangle. Engagement. Regular collaboration in MozFest messaging and storytelling. Rallying around MozFest as a key moment in calendar and highlighting the user control campaigns. David Bryant, MoCo’s CTO. Bringing tech and engineers interested in IoT. This year is shaping up to have some of the most locally-driven partnerships with UK leaders, and we are trying to leverage the investment in partner relationships. We are working with an incredible range of companies who are bringing their thoughts and knowledge to different sessions over the weekend. Mozfest is where the Mozilla Learning plan comes alive. Inviting people to “give feedback” on a dull document or slide deck. (yawn). That’s not what we do here at MozFest! Keynotes. Less VPs, more emerging and successful leaders from our community. We want people to share their personal experiences. Deep listening. We want to use MozFest as an opportunity to test and listen to the people who use our products and learn how we make them as suitable as possible for them. Learning and living the plan together. Mozfest is an opportunity for staff and community leaders to learn and teach the plan together. Mozfest is an unrivaled storytelling opportunity for MoFo. Show how individuals and organizations, not just corporations, have the ability to shape the Web and its values. Show that solutions to the biggest threats facing the Web are increasingly political, and require a grassroots movement. Demonstrate how universal web literacy empowers individuals to shape the Web, and cements the Internet as a global public resource. Highlight recent grassroots victories and web literacy progress and start to identify future opportunities on the horizon. Ensure that MozFest is open to everyone, no matter of your experience level. Cultivate leadership in not just those facilitating but also everyone who is taking part in the festival. Ensure that those who volunteer and help with the festival, also receive the same guidance on becoming leaders in their communities. Fife was a big success. We’re deeply seeing the benefits, especially for the cohesion and collaboration within the 52+ member strong program group. Some of the Fife team discuss their ideas for the personas who they think will attend MozFest 2015. Check out Michelle’s blog post here about what we got up to. We’re doing this through leveraging Mozilla London office and turning it into a hub for open projects from all around London as well as by inviting new companies who can bring their insight and knowledge to MozFest.